It seems that the politicians thrive on the basic principle of “break all rules and get away with it.” Unfortunately, the ensuing Lok Sabha elections threaten to follow this principle. Watching television and playing videogames is a common trigger for photosensitive epilepsy. The nearer you are to the screen, the more likely it is to trigger a seizure, said experts during a workshop on paediatric epilepsy, organised by the PGI paediatric department here today. In Punjab, the poll plank of the Akalis of offering realistic land acquisition compensation sells no more. Despite the party quoting Rs 1.5 crore offered by the state government to acquire land for the international airport at Mohali, landowners and farmers of Mohali, Ropar, Patiala, Nawanshahr, Ludhiana and Kapurthala districts were no more interested in offering their land for the Mohali-Phagwara expressway. The Consumers Disputes and Redressal Forum has directed the Reliance General Insurance to pay Rs 1 lakh as the insured amount to the complainant, Ajaib Singh Tung, whose claim for his wife’s gall bladder treatment was rejected by the company. “There is a dearth of true leadership in the Opposition that could match the stature of leaders like Jawaharlal Nehru, Indira Gandhi or Rajiv Gandhi. None of these leaders ever thought beyond the welfare of countrymen,” claimed former Punjab Chief Minister Rajinder Kaur Bhattal here today. Continuing with a tirade against the Congress in general and the Prime Minister in particular, BJP general secretary Arun Jaitley today accused Manmohan Singh of “cheating the public”. As the D-day draws closer, fissures in the BJP are coming to the fore. 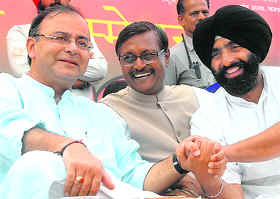 This was visible today during a BJP’s workers’ rally addressed by party general secretary Arun Jaitley. BSP’s Brahmin Sammelan turned out to be a stage for leaders to eulogise party supremo Mayawati at Parshuram Bhawan, Sector 37, here today. 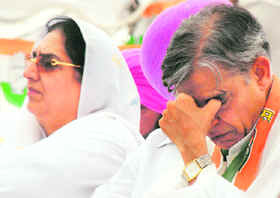 I never imagined that the political legacy of senior Akali leader, Capt. Kanwaljit Singh, will flitter away so soon and in such a manner. Just 12 days after his death his bête noire, NK Sharma, who was expelled from the Shiromani Akali Dal for opposing him in the MC elections, is back in the party fold and is being projected as its new face in the Banur area, once considered a stronghold of the late Capt. 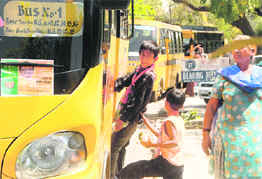 Chandigarh, April 12 The Chandigarh administration’s new initiative, though on experimental basis, on emergency cases has turned out to be a boon for patients at the Government Multi-Speciality Hospital, Sector 16. Under the initiative, critical patients brought to the emergency are provided with free treatment for the first 24 hours of admission. Stressing that states have to adhere to fiscal discipline, hard budget constraints in other words, under the rule-based framework of fiscal responsibility legislations (FRL), the Reserve Bank of India has said that state governments should relate expenditures by focusing on the provision of core public and merit goods. The Haryana Urban Development Authority (HUDA) has laid off its responsibility to supply the drinking water to people living on the upper floors of residential buildings. HUDA superintending engineer AK Aggarwal said his department was to ensure water supply up to ground floor only and from there it was the responsibility of residents to take the water to the upper stories. The filling of the post of chief fire officer, which has been lying vacant for the past six years, in the fire and emergency service department seems to be last on the priority list of the Chandigarh municipal corporation. The department of internal medicine, PGI, organised its annual continuing medical education programme on “Emerging issues in medicine” here today. Highlighting the need to tackle the problem of global warming at the earliest, environment activist and Chipko movement champion Sundarlal Bahuguna stressed upon the need to have a sustainable development vision for the Himalayas at a press conference here today. Bahuguna was a part of the ‘Himalaya Bachao Rally’ at Bilaspur on April 9, which was held for the cause of displaced people because of building of Bhakra Dam. He condemned the growth of mining projects in mountain states due to the havoc that they play with the mountains. The world president of Rotary International (2009-10), John Kenny, honoured three eminent members of society for their dedicated service to humanity here today. He gave away crystal mementos as the Rotary Club made the roll call of honour citing many distinctive accomplishments of the personalities that were being honoured. An exhibition of photographic panels is all set to zoom in on the issue of “building a culture of peace for the children of the world”, with the support of United Nation’s culture of peace initiative. With the 2010 Common Wealth Games scheduled to be held in New Delhi drawing nearer, there is a need to expand and streamlining the growing aviation industry in India. After the spate of dacoity cases, the town of Panchkula has been witnessing incidents where its residents go missing under mysterious circumstances. Close on the heels of a 40-year-old lawyer of consumer forum gone missing since March 30, now a resident of Sector 19 had been missing since yesterday. Congress candidate from the Anandpur Sahib Lok Sabha seat Raveneet Singh Bittu today played the card of Prime Minister Manmohan Singh to woo the educated voters of the city. Addressing a public rally here late this evening, Bittu said the PM had a clean image and knew about the issues and problems of Punjab. He was taking a lot of stress for the betterment of the state, he added. The Punjabi Bhaichara Mahasabha, Panchkula, will organise a “Punjabi Parivar Milan” programme on the occasion of Baisakhi tomorrow. In a decision taken at a joint action committee meeting, auto-rickshaw operators from Mohali-Panchkula-Chandigarh have announced to go on a two-day strike from tomorrow. Around 7,000 students appeared for the IIT entrance test conducted at various centres here today. The test was held in two shifts, each of three-hour duration. The minimum qualifying marks for students in general category will be 60 per cent in aggregate. A seminar on “Advances in Communication Technology” was organised by the Department of Electronics and Communication Engineering at IET Bhaddal yesterday. Dr Manjit Singh, associate direcdtor, TBRL (Terminal Ballistic Research Laboratory), Ramgarh, was the chief guest and Pramod Madan, general manaer, Himachal Futristic Communications Ltd Mohali was the guest of honour on the occasion. A fine batting performance by Narinder Bunty (80 off 60 balls) enabled United Sports Club to defeat Azzaro XI by 42 runs in a league match of the Tirath Singh Memorial League Cricket Tournament, being organised by the Chandigarh Sports Club at JP Institute of Cricket Technology here. The Fatehgarh Sahib police today booked six people for allegedly cheating a resident of Sodha village of Rs 55 lakh. The Atmanand Jain Institute of Management and Technology organised a guest lecture on “How to become the best employee in an organisation”. A personality development workshop was organised at Aryans Business School (ABS) yesterday. Dr NK Sahni, founder head, post graduate department of commerce and management, SD College, Chandigarh, was the keynote speaker. The workshop was organised for over 275 students of BCA, BBA and MBA. Tej Prakash Singh, former Cabinet Minister of Punjab and son of former Chief Minister Beant Singh, who was spearheading campaign of Congress candidate Ravneet Singh Bittu from Anandpur Sahib Lok Sabha constituency termed SAD candidate Dr Daljit Singh Cheema as a novice politician. Well-compiled half centuries by Subeer Hayer and Jagnoor helped YPS-Mohali drub Gwalior school by nine wickets to enter into the semifinals of the 8th Dhruv Pandove Memorial T20 Inter-School Cricket Tournament, being organised by YPS- Patiala. In a decision that could have a far reaching impact on the trespassers of unattended NRI properties in the region, the Panchkula court has not only granted decree of possession of house under illegal possession within one month, it has asked the guilty to pay more than Rs 5 lakh as the mesne profit for the period of illegal possession of the building. In a special drive, the city police arrested at least four persons for possessing intoxicants in illegal manner from various locations of the city yesterday. Rania, a resident of Bhaskar Colony, Sector 25, was nabbed from near Sector 25 cremation ground, for possessing 3 g of smack. A case under Section 21 of the NDPS Act has been registered with Sector 11 police station. 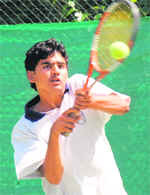 Resham Singh, Manish Kumar, Manoj, Uday Singh Mann, Ravinder Singh, Mandeep Kumar, Harpreet Singh Sidhu and Manish Drall qualified for the main draw of the under-16 boys singles of the IDBI AITA Super Series Tennis Tournament being held at the CLTA Stadium and Lake Club courts here today. Resham Singh outplayed Nishat Eqbal 8-1 in the final qualifying round while Uday Mann prevailed over BS Rahul of Karnataka 8-5. City boy Zoravar Singh Thiara bagged two medals out of the three main events during the recently held national-level equestrian championship Delhi Horse Show (DHS) in New Delhi. 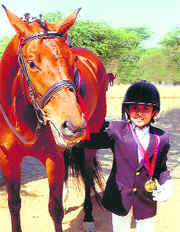 The 11-year-old horse-riding prodigy won a gold medal in hacks and a silver in dressage event. However, he could not bag a medal in the jumping event. “I took it as a mere exposure for my German mare, L’Avenue, that participated in the show jumping event for the first time,” he tells. “Next year L’ Avenue will participate as it has got an exposure now,” he adds. Zoravar Singh Thiara with his German mare L’ Avenue at the Delhi Horse Show. The Chandigarh Golf Club will be maintaining its greens with the first computerised irrigation system, which was unveiled by Punjab chief secretary Ramesh Inder Singh here yesterday. Brig HBS Bedi clinched the overall title in the Chandigarh Golf Cup 2009 played on the par-72 greens of the Chandigarh Golf Club yesterday. About 84 golfers from Delhi, Chandi Mandir and Chandigarh Golf Club participated in the event sponsored by DP Singh of Sara Group. The Chandigarh Cricket Association, affiliated to the Punjab Cricket Association, has invited 22 probables for coaching camp that will be held on the Guru Nanak Public School grounds here tomorrow. According to CCA secretary Mohinder Singh, the selected boys should report at 4 pm tomorrow. The probables were selected during the recently concluded Under-16 Inter-Academy Cricket Tournament. A brilliant all-round performance by Amardeep Sonker (106 off 56 balls and 4 for 26) enabled Coaching Centre, Sector-19, beat Puri XI, Ludhiana, by 28 runs in the triangular series being organised by the Chandigarh Cricket Association at Government Senior Secondary School, Sector 19, here today. Haryana bagged overall championship of the All-India Kickboxing Cup 2009, being organised by the Amateur Chandigarh Kickboxing Federation, at Sector 10 Skating Rink here today.